But the Miami-Dade Clerk of Courts office website has a notice that a mandatory fine is still owed for a 2006 felony case for which Office plead guilty. A few days after registering to vote, the unpaid fine of over $1,000 was brought to his attention by WLRN. “This is for an old, old charge,” he said in frustration after calling for information. After years spent getting back on his feet, Office has a steady job now, with house and car payments due monthly. “This is ridiculous," said Office. "I mean come on, man." The situation is emblematic of something some proponents of Florida’s Amendment 4 are worried about: that under a certain interpretation of the Amendment, hefty fines associated with felony charges will need to be paid before someone registers to vote. Amendment 4, which went into effect on January 8 after being approved by more than 60 percent of votes last November, says most people convicted of felonies in the state will have their right to vote restored “after they complete all terms of their sentence including parole or probation.” But in several state criminal statutes, specific fines are explicitly attached to the sentencing for a crime. In others, fines are tacked on as “orders” from the court. The charge Office plead guilty to is one of them. Office says he’s not worried about the outstanding fines impacting his right to vote. “It’s not like you committed another crime,” he said. If fines are considered part of a criminal sentence, Florida residents could have to pay at minimum hundreds of millions of dollars in outstanding fines related to felony charges before they are able to vote, according to a WLRN analysis of state law and records. In many cases, paying off the fines could also mean funneling money to private debt collection agencies, which under state law can assess up to an additional 40 percent rate on the amount owed. Clarence Office registered to vote in Miami-Dade County the day Amendment 4 went into effect. The intention of Amendment 4 is clear. But the vagaries of the word “sentence” are being bounced around the state legislature, which appears likely to take up “implementing legislation” that seeks to define the term. County clerk of courts offices hold records that could be used to verify if someone’s sentence is complete. At least one Florida office is explicitly advising people trying to get their right to vote restored that the verification process can be tricky. “Please note that even if the case status may indicate ‘closed’, that does not guarantee all terms of your sentence have been completed,” reads a notice posted on the Orange County Clerk of Courts website. The site then directs users to search for the balance they owe on a case. 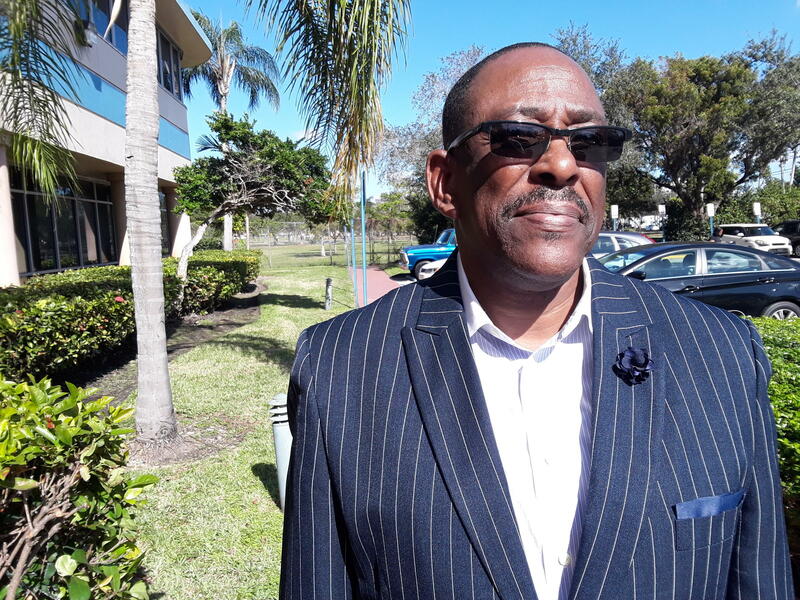 “If a fine is determined to be part of the sentence, the argument can be made: Well, a person’s rights are not restored until the person is able to pay off the entire fine,” said David Barksdale, a criminal attorney in Jacksonville and current chair of the Criminal Law Section of the Florida Bar. Several clerk of courts offices told WLRN that fines owed stay on file for decades, something that can cause confusion especially for older cases. 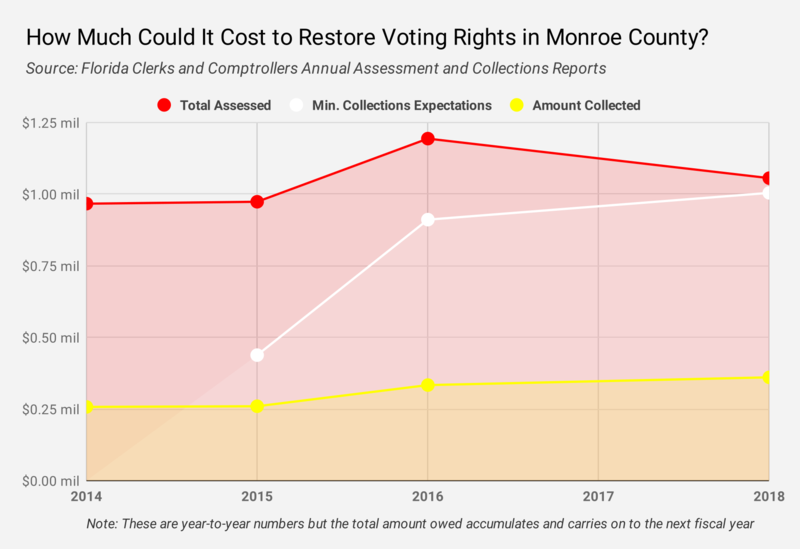 “You could have committed a felony in 1940, and think you’ve paid all your fines, but you didn’t pay a fine,” said Monroe County Supervisor of Elections Joyce Griffin. That can technically be used against someone who registers to vote, unaware that they haven’t completed the full terms of punishment ordered by the court. Miami-Dade State Attorney Katherine Fernandez-Rundle acknowledged the “gray area” of when a sentence is completed. But her office has pledged not to prosecute anyone who registers to vote during the roll-out of Amendment 4, who later learns they are not eligible to do so because they haven’t paid restitution or fines associated with the charge. “This should not become a fear factor,” said Fernandez-Rundle. The sheer amount of outstanding fines stemming from felony convictions is staggering. Other counties, like Broward, Monroe and Collier, did not immediately have total numbers available. Across the state, over $1 billion in felony fines were issued between 2013 and 2018 alone, according to annual reports from the Florida Clerks and Comptrollers, a statewide association. Over that five year period, an average of only 19 percent of that money was paid back per year. The amount left unpaid per year stays on the books, and carries on to the following fiscal year. Outstanding court fines put a disproportionate burden on impact lower-income residents. Between 2014 and 2018, an average 83 percent of the money levied per year by the courts is labeled by the state Clerk of Courts association as having “minimal collections expectations,” meaning the courts know they are likely to never receive payment on the debt because the defendant is too poor to pay. 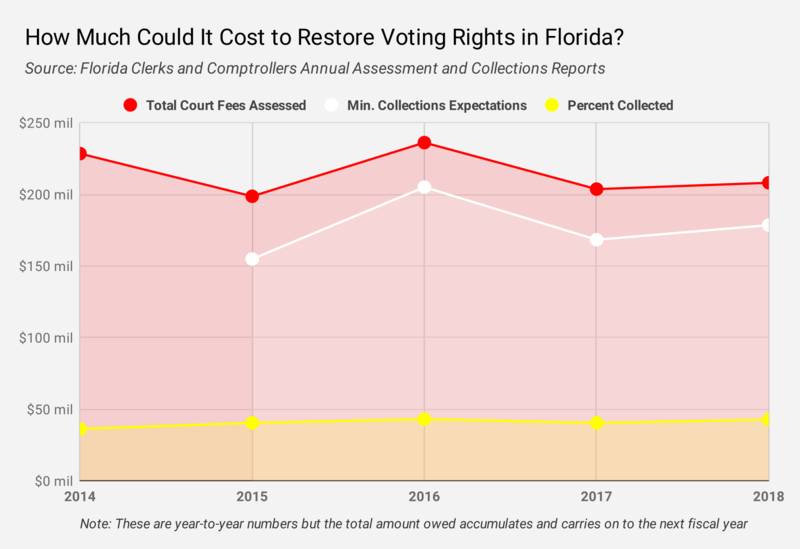 Ashley Thomas, the Florida State Director of Fines and Fees Justice Center, a non-profit advocacy group, said the current funding system for Florida courts is an injustice, even more so now that it could be tied to someone’s right to vote. Since the mid-1990s, the Florida legislature has created “more than 20 new categories of financial obligations for criminal defendants,” according to an analysis by the Brennan Center for Justice. These fines are financial penalties for crimes, that stand apart from court costs and restitution, or compensation to a victim of a crime. At the same time, Florida lawmakers have eliminated almost all exemptions for defendants who can’t pay those fines. Fines are attached to criminal charges for everything from money laundering to driving under the influence, writing graffiti and soliciting prostitution. The fines are often mandatory. For instance, if someone is found guilty of the theft of agricultural animals, they face a mandatory $10,000 fine per count. Drug trafficking is a major moneymaker for the state, at least on paper. Upon conviction for drug trafficking, defendants face a mandatory fine of $25,000 to $500,000 per count. As a result, anyone convicted of the crime could likely owe thousands of dollars before they gain the right to vote. State and county governments are aware they are simply never going to get that money, said Thomas. The people who end up in the justice system are already disproportionately poor, and that’s before they get convicted of a felony and serve possible jail time, further impacting their ability to find a well-paying job. “No one should be precluded from voting simply because they’re poor and unable to pay the high cost that Florida charges individuals convicted of a crime,” she said. She called voting a “fundamental” right. Inflating the raw number of how much in fines is owed is a 2004 law that allows County Clerk of Courts offices to enter into agreements with debt collection agencies to service outstanding debt. Once a debt goes unpaid for 90-days, counties can allow private collection agencies to assess up to an additional 40 percent fee onto whatever was initially owed to the courts. 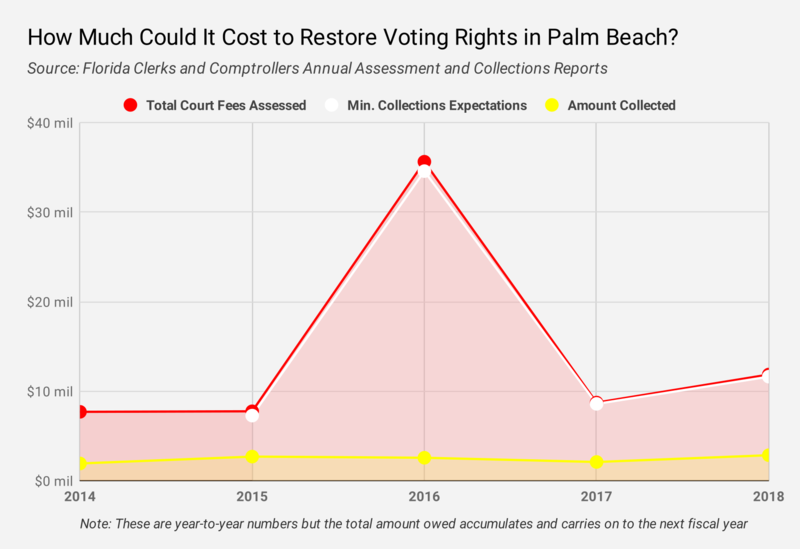 Some counties allow for less: Clay and Brevard Counties allow collection agencies to tack on an additional 25 percent, for instance. But others, like Duval and Miami-Dade, allow for the full 40 percent. Seminole County does not use collection agencies. A WLRN review of county agreements across the state found four collection agencies that currently operate here: Texas-based Linebarger Goggan, Blair & Sampson; Texas-based Municipal Services Bureau; Pennsylvania-based Penn Credit; and Pennsylvania-based AllianceOne. AllianceOne has spent an estimated $305,000 lobbying the state legislature since 2014, according to state records, while Linebarger Goggan, Blair & Sampson has spent an estimated $670,000 over that time frame. None of the other collection agencies responded to requests for comment. Miami-Dade Clerk of Courts Harvey Ruvin said his office played a role in advocating for the use of collection agencies in the early 2000s. “We got a lobbyist and we got a bill passed,” he said. Ruvin said outstanding debt from felony convictions cannot be easily written off or sold, since it often involves separate municipalities within the county. “All I care about is getting a full face value so I can distribute it according to the inter-local agreements,” he said. 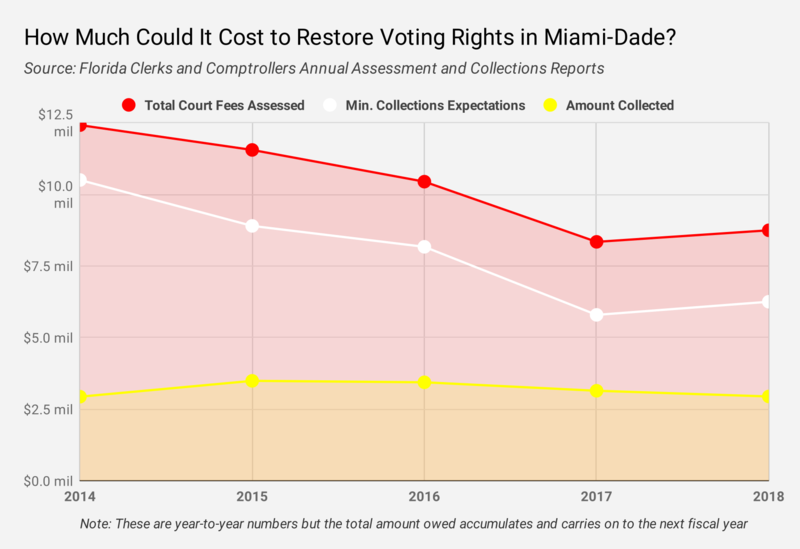 “There was no way for us to budget out for something like Amendment 4, it was an unknown factor,” said Dian Diaz, the chief operating officer for the Broward County Clerk of Courts office. But Diaz said her office offers what could be a partial solution for people looking to pay the fines related to felony charges. 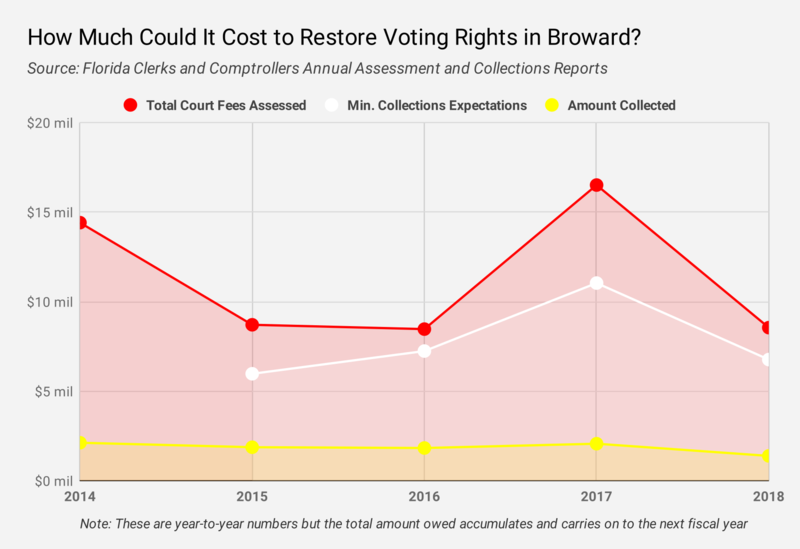 The Broward County Clerk’s office allows companies to charge up to 35 percent for fines that go into collections, but once a year (this year is in March) the clerk's office offers what it calls “Operation Green Light,” as a kind of amnesty. “If you come during that week, we’ll withdraw it from the collection agency, so you won’t have to pay the extra 35 percent,” said Diaz. Miami-Dade, Palm Beach, Citrus, and Orange Counties have instituted similar amnesty programs. Fernandez-Rundle, the Miami-Dade state attorney, offered another possible solution. Some jurisdictions over time change some criminal fines and fees into civil fines. The same could be done on a larger, more directed scale. Following a messy election, a fresh political season is set to begin in Florida. New state leaders will be sworn in Jan. 8, including incoming Florida Governor Ron DeSantis. Although he still has a few decisions to make on key positions, DeSantis and his team have worked to fill hundreds of jobs in the administration, including for some of the state’s most prominent posts. Meanwhile, state lawmakers are filing bills for the 2019 Legislative session that begins in March.